Committee Member of the Chinese People's Political Consultative Conference (CPPCC), Vice Chairman of the Buddhist Association of China, Chairman of the Buddhist Association of Hainan Province, Abbot of Shenzhen Hongfa Temple, Sanya Nanshan Temple and Nepal Zhonghua Temple. 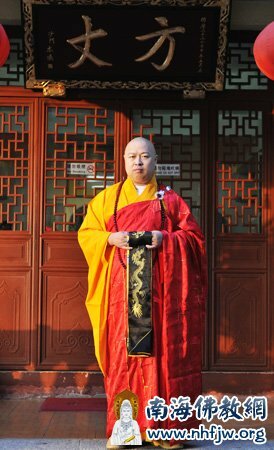 Venerable Master Yin Shun, PhD in Buddhist Studies, is the Dharma successor of Venerable Master Ben Huan, one of the most influential and respectable elder monk in China, and became the 45th successor of Linji School of Chinese Buddhism. Master Yin Shun now serves the following positions. Committee Member of Chinese People’s Political Consultative Council (CPPCC), Vice Chairman of the Buddhist Association of China, Chairman of the Buddhist Association of Hainan Province, Honorary Chairman of Buddhist Association of Hubei Province, Chairman of the Buddhist Association of Shenzhen, Abbot of numerous temples including Shenzhen Hongfa Temple, Hainan Nanshan Temple, Nepal Zhonghua Temple, Dean of Benhuan Buddhism Academy, Dean of Nanhai Buddhism Academy. He is also the Supreme Consultant of Cambodian and Chinese Friendship Association and the receiver of Grand-Order-of-National-Merit of Cambodia. Due to his extraordinary contribution to Buddhism and culture exchange between China and Thailand, Master Yin Shun has been entitled the “Chinese Master leader of Excellency” by King of Thailand. As abbot of many temples, Master Yin Shun not only adheres to the tradition of Buddhism, but also tries to introduce modern management. He devotes himself to the construction of “the Humanistic Buddhism”. Under his philosophy, Hongfa Temple is gradually growing into one of the most vibrant urban temple and a model for other Chinese temples. It is a bridge of Buddhist Cultural exchange between Mainland China, Hong Kong, Macau, Taiwan and other countries and regions in the world. Master Yin Shun attaches great importance to Buddhist education and transmission. He signed cooperation agreements with Peking University and Chulalongkorn University, and established Benhuan Buddhism Academy and Nanhai Buddhism Academy to promote education among Chinese monks and Buddhist followers. Master Yin Shun is also a writer and an elocutionist. He edited and wrote several books, such as “Hongfa Series”, “Chinese Buddhism Ritual”, “Platform Construction of Humanistic Buddhism”, “Master Xu Yun and Jizu Mountain Buddhism”, “Explanation of The Diamond Prajna-Paramita Sutra”, etc. He has been invited to attend several forums including the Phoenix TV station and made dozens of public speeches which have extensive and deep influence on the society. Master Yin Shun put his innovation and exploration spirit in actively promoting social welfare and charity around the globe. Master Yin Shun build upon the Chinese Buddhism tradition of international exchange and devote himself to religious communication with other countries. His continuous, extensive and profound dialogue with religious leaders from various nations including U.S, U.K, Australia, Japan, Korea, Cambodia, Laos, Mongolia has fruitful result, contributing greatly to in-depth culture exchange and the establishment of a shared human destiny. His devotion to Buddhism exchange has been highly praised by numerous national governments and the society.